People often ask who the original members of Commercial Art are. Actually, none of the existing members were in the band in the beginning. Commercial Art was originally conceived by Barry Coffing in 1985. Barry put the band together with fellow HSPVA (High School of the Visual and Performing Arts) alumni, Jean July and Valerie Johnson, and veteran players Bill Rowe, Rick Spies and Tim Harris. Barry got the band an engagement at Club Flamingo, the little club next to Ruggles Grill at 907 Westheimer. Within a few weeks, Commercial Art had turned the quaint little bar with a handful of customers into an electrifying scene filled with fans dancing in the isles and on the tables. One year later, bandleader Barry Coffing moved to Los Angeles. Guitar player Tim Harrris left at this time. Drummer Rick Spies fillls the vacant keyboard and guitar chairs with Tony Taboada and Jon Perry. They would spend the next 15 years (and counting) working in different evolutions of Commercial Art, and become the foundation for Houston’s most consistently working band. The make-up of the band was the traditional 4-piece rhythm section (guitar, keyboards, bass and drums), and two female vocalists. With a background in performance, drama and choreography, the two vocalists brought a highly energized stage act which had fans coming back for more. After Barry left, a lot of attention shifted to Valerie Johnson. Twenty-two, tall, dark and beautiful, Valerie embodied star-quality. She got a break and went to Paris to become a fashion model. Valerie was replaced with Mysti Day, a young enormously talented vocalist who had cut her teeth playing the chitlin’ circuit. Her gutsy renditions of Aretha and Anita Baker blew the crowds away. Drummer Rick Spies decided to join Barry in L.A. He was replaced by Carl Lott Jr. Bill Rowe, bass, took over as bandleader. 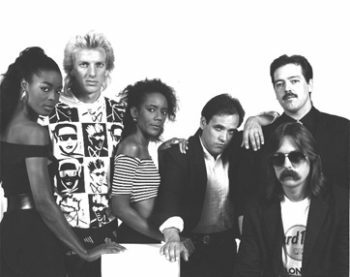 The band became the one stable element at Club Flamingo. While the club changed ownership five times, Commercial Art and the packed house they were drawing were the constants. Mysti Day is offered a major record deal and leaves. She is replaced by Vantrese, a seasoned local vocalist. The band took a week off from Flamingo and went to Galveston to take part in a film starring Roy Scheider. The film called for a scene in which a band plays while a mass murderer chases detective Roy Scheider’s girlfriend through a nightclub. Commercial Art played the band. Bill, Tony, Jon and Carl would remain a steady rhythm section for the next six years. However, the seemingly never-ending rotation of female vocalists continued for the next few months. First, Vantrese damaged her vocal chords and had to leave. She was replaced by Alaina King. Not long after Vantrese’s departure Jean July decided to move on. 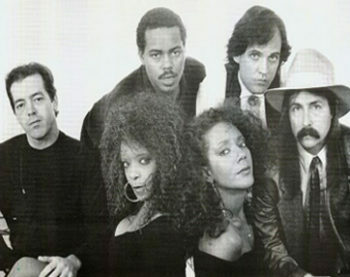 The band brought in LaRita Perry to take her place. During this time TonyTaboada takes over as leader. Due to the high rate of turn over in the ranks of female vocalists, Jon and Tony became more involved in singing lead. The act now featured a repertoire which split the lead vocals fairly evenly between the two females and Jon and Tony. The new team approach worked. 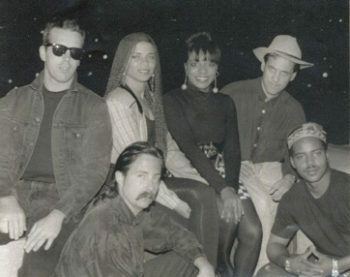 When the band moved from Club Flamingo to Cody’s in 1990, the band was so successful that the engagement lasted 27 months- the longest in the 17 year history of Cody’s. The period 1989-1992 saw no line-up changes. 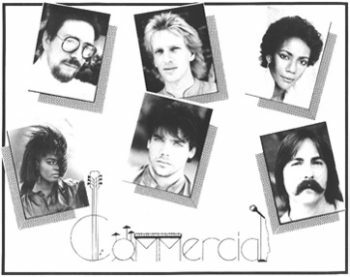 An album entitled “Commercial Art” was recorded. During this period, a seventh piece was added. 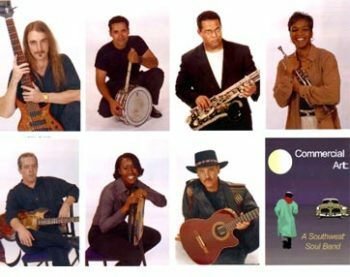 Saxophonist Keith Malonson joined in 1992 bringing in a new dimension to the Commercial Art sound. Valerie returns from Paris and replaces LaRita Perry. Commercial Art returns to 907 Westheimer, now called Maxie&Jake’s and owned by Bruce Molzan of Ruggles Grill. From the first night, crowds were back as if they had never left. During this period interest began developing for the band in the private party market. A problem arose when the crowds that would come to see the band at the club would leave when they found out the band would not be there. The club owner started finding objections with every possible substitute for Commercial Art. The GM at the Westin Oaks had been courting Commercial Art to be the house band at their venue, The Roof. After a particularly unpleasant blow up at Maxie & Jake’s resulting from a book-out, the band decided to move their operations to The Roof. Around this time, Alaina King left and was replaced with Kimberly Smith. The Roof , once a popular room, had been dying a slow death. Bringing in Commercial Art was a last ditch effort to breathe new life into it. Six months into the gig, the band got word that the room was to be shut down and only used for special events. Carl Lott Jr.decided it would be best to make a change. Robert Aguilar, a Houston native who had recently moved back from L.A., took over the drum chair. Commercial Art would be the last of nightly live music at The Roof. After finishing out their 11 month contract, the band returned to its old haunts, Maxie&Jake’s. 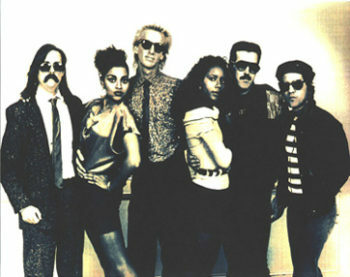 Shortly after returning, Bill Rowe called it quits after ten years in the band. Kim Smith left to pursue a solo career. Then Valerie, who had been going to law school, got pregnant with her second child. Between school and the family, she would soon be too busy to stay in the band. Robert Aguilar had a family emergency and was out for three months. The skeletal core, now consisting of Tony, Jon and Keith, set about rebuilding. Somehow the band weathered the storm. Robert returned. 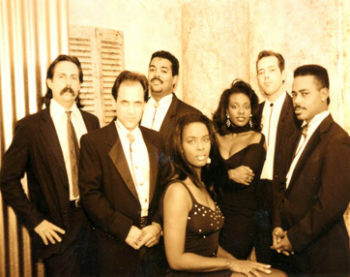 Kevin Olivier was added on bass, and Dana Jackson and Kamil became the vocalists. Commercial Art was off the ropes and ready for a new phase of stability. The new members were worked in and the line-up stayed consistent for the next four years. Eventually the band decided to leave the club and make themselves available to the more lucrative private party market. The move was a success. The band was making more and working less. However, the members soon found that they missed the intimacy of playing clubs. The band started filling in the calendar with club dates. 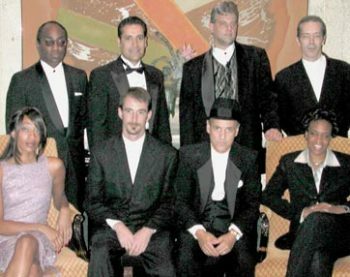 They became regulars at The Mercury Room and The Skybar. Keith Malonson got the opportunity to become a full-time minister. Approximately one month before Keith was to leave, trumpet player Jim Brady sat in with the band. Knowing Keith would soon be gone, and impressed not only by his trumpet playing, but also his solid drumming abilities, Tony asked Jim to come on board. By the time Keith left, Jim was worked in and could coach whatever sax man would end up filling the chair. 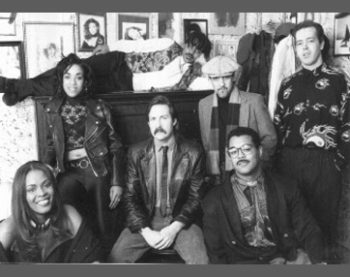 Early in 2000, Kamil was replaced by Ayanna, and Cloris Grimes became the band’s regular sax man. The current line-up can be seen at their latest home, Ringside At Sullivan’s. a great place to check out one of Houston’s institutions of live music, Commercial Art, a Southwest Soul Band. 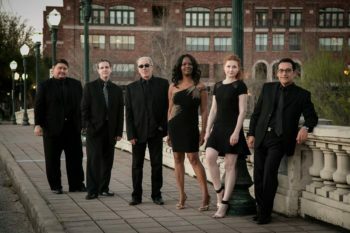 When not performing for a private event, you will usually find us at our favorite spot , The St Regis Hotel, on the 1st floor ,in The Remington , located at 1919 Briar Oaks Lane @ San Felipe , in Houston , Texas . We are usually there on either Fridays or Saturdays , please check with front desk , for which night , and don’t hesitate to ask for us by name ! …. Commercial Art !